After an on-and-off start to the season, the Beavers of Bemidji has strung some big-time wins together, having split their weekend series at Bowling Green and sweeping Michigan Tech outside on Lake Bemidji last weekend, albeit with some extra time Friday night. In an interesting turn, the Beavers are led in scoring by senior defenseman Justin Baudry with 19 points, though their leading goal scorers are a pair of sophomore forwards Aaron Miller (10g) and Charlie Combs (9g) . Freshman Zach Driscoll and sophomore Henry Johnson seemed to have split more weekends, with Driscoll starting 15 games, and Johnson starting 13. GAA and Save % are nearly identical, though the freshman does have 2 more wins. With 10 series left before the post season, the Lakers have positioned themselves to be in the final spot for home ice this season. They have the tie breaker, as of now, on Michigan Tech, and are only a point ahead of their opponents this weekend. Through the USCHO poll, the Lakers are ranked #18, however through the Pairwise rankings, they are at #20. They’ll need to start a good run this weekend in order to break into the top 15, and a chance at an at-large bid. Our top three scorers are the same as they’ve been for a while – led by captain Diego Cuglietta (17-7-24), Anthony Nellis (11-12-23) and Max Humitz (9-12-21). Diego is officially a point-a-game player, with Nellis being 1 point behind that mark, the same with Humitz going into the weekend. The goaltending will be the story in the later half of the year. Nick Kosshoff has played in 16 games, with a record of 11-3-2, and Mareks Mitens following him with 8 games played and a 4-4-0 record, with all 4 of the wins being shutouts. This includes last weekend where Mareks made 29 saves. While I don’t think Nick has lost his net, I think Mareks is certainly lighting the fire – hopefully a bit of competition is a good thing. Friday night, the Lakers will also try to battle domestic violence, providing a free t-shirt to the first 1000 fans so they can white-out the arena, so do try to come out to the arena this weekend to support your Lakers. However, if you can’t, it will be on over the air on 99.5 YESFm, streaming through Yesfm.net or through the TuneIn app. Flohockey.tv will have the video feed of the game. So, we meet again, Mankato. Since the realignment, the Mavericks have had the Lakers number. 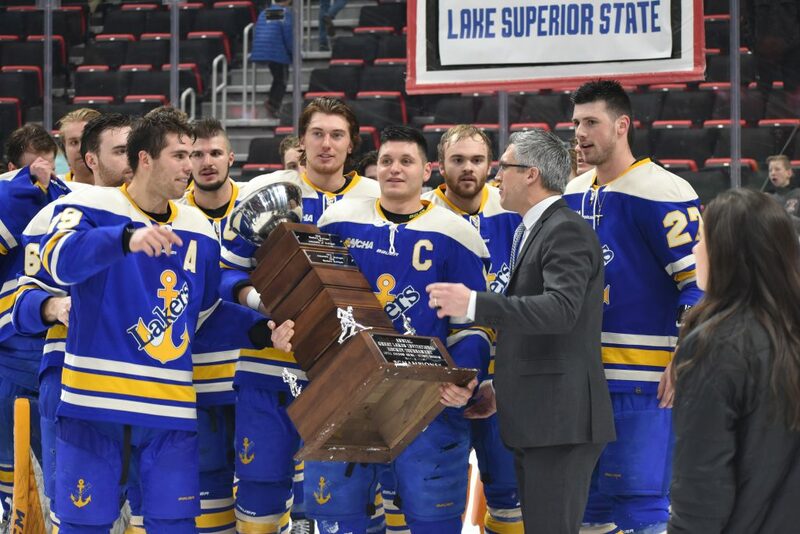 Of course, Lake State hopes that changes this weekend, but looking at Minnesota State’s record of 18-5-1, and a perfect 11-0-0 at home, that this weekend will be another battle. Surprisingly, the Maverick’s top scorers are either juniors or sophomores. Junior forwards Marc Michaelis and Parker Tuomie top this list, with 26 and 22 points respectively, followed by sophomore forward Jared Spooner at 21 points. In net, Freshman Dryden McKay has won the starting role, having played in 17 games with a 11-4-1 record, 2.05 GAA and a .919 Save %. Behind him is senior Mathias Israelsson who has played in 9 games this season, 7-1-0 record, with 1.74 GAA and a .908 Save%. On a side note, they’ve out of the 12 series they’ve played as part of the regular season, half of them have been against ranked opponents (Ferris x2, Bemidji, UAA, Michigan Tech and Alaska were unranked). They dropped 1 game against any of those opponents, Saturday night at Bemidji. The only series they were swept in was against the then #12 Bowling Green in December. They also lost against Minnesota Duluth and tied against Arizona State at the Desert Hockey Classic, and then #16 North Dakota early in the season. Minnesota State-Mankato: The real test to any season. 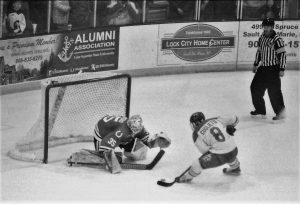 This season, however, having been ranked on and off throughout the season, becoming the new GLI champions, and being on a 8-game unbeaten streak, Mankato will be the ultimate gut check. Remember: Six of those wins came from opponents #52 or lower in the pairwise. The other two are #30 Michigan State and #31 Michigan Tech. The top point getters stay the same, except Max Humitz breaks into the top. Diego Cuglietta and Anthony Nellis lead with 23 and 22 points respectively, with Humitz bringing up the rear at 19. 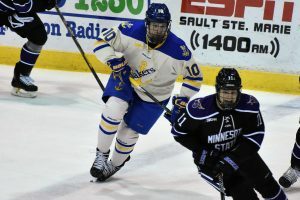 Both Cuglietta and Nellis have also been nominated for the Hobey Baker Award – you can vote for them here (https://www.hobeybaker.com/vote) , and they also have a shot at breaking 100 points, though by my math, Humitz should be the next 100 point scorer next season. Puck drops at 7:07pm CST, so 8:07 pm both Friday and Saturday nights in Mankato. Locally it can be heard on 99.5 YESFm, or on it’s website stream or on Tunein. You can see the game on FloHockey.tv for a nominal fee. Shots from the Lakers’ recent series against the Chargers of Alabama Huntsville. 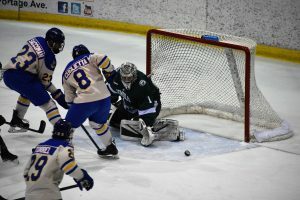 The Lakers prevailed on Friday night with a 7-2 win, before a 1-1 tie on Saturday that saw the Chargers collect 2 of 3 league points in a shootout. Going into this weekend, the Chargers of Alabama-Huntsville are only two points above Ferris State for the final playoff spot. But despite their record, they do have two wins against some pretty good teams: Michigan Tech and Bemidji State. They also forced overtime last Saturday against Ferris to take an extra point. The Chargers are led by two 8 point scorers, forwards Christian Rajic and Jesper Ohrvall, but almost all of their points are from assists. Jack Jeffers, Bauer Neudecker and Austin Beaulieu are the top goal-getters, with 5, 4, 4 respectively. They’ve been riding sophomore goaltender Mark Sinclair this year, playing 14 games compared to senior Jake Theut’s 8 games. However, they both have 2 wins each, and nearly the same save percentage, with Sinclair having a .918 and Theut with a .917. It’s certainly been an interesting season for the Lakers. On the road, they are almost perfect with 9-1, 2-0 at neutral sites, but are only 2-5-1 at home. They hope to make that 4-5-1 this weekend. They are led by two 21 point scorers, seniors Diego Cuglietta and Anthony Nellis. Lukas Kaelble follows up in third with 16 points, 15 of them being assists. We’re of course hoping for the return of Max Humitz, but I personally hope that he takes all the time he needs to properly grieve, so he can come back 100%. 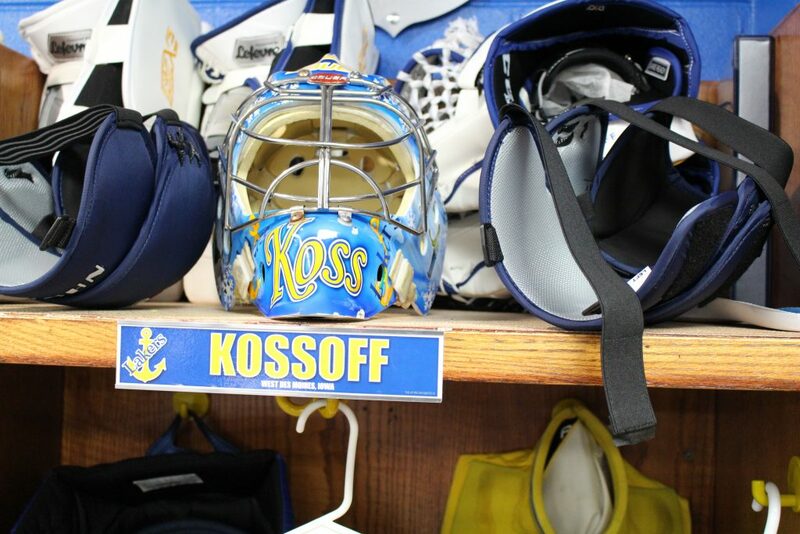 On the backend, Nick Kossoff has all but won the starting spot in net, having won 10 of the 13 games he’s started in. Sophomore Mareks Mitens is just on the wrong side of .500, winning 3 of the 7 games he started. Despite the way Kossoff has played, I would not be surprised if the coaching staff try to get Mitens some ice time this weekend. The puck drops both nights ay 7:07pm at the Taffy Able Arena here in Sault Sainte Marie. The game can be heard locally on 99.5 YESFm, or for those not in the area, Bill Crawford will have the play by play on the YESFM stream, or on the TuneIn app. If you care to watch the game, but not in the arena, it will be shown on FloHockey for a fee. What is there to say about this Anchorage team that other pundints haven’t said? According to the current Pairwise rankings, UA-A are dead last in the whole of the NCAA. Their points leader has 6 total points, with 4 being goals, is Nicolas Erb-Ekholm, followed by Nils Rygaard with 3 goals, 2 assists for 5 goals. They’ve also utilized three goalies t his year, but the only one has their two wins, and that is Brody Claeys. Former head coach Matt Thomas certainly didn’t leave any real help to first year head coach Matt Curley, and Mr. Curley has a lot of work cut out for him to get the program on the right track after dwelling in the cellar for a number of years, which is not that unlike Lake State. What can I say about these Lakers that hasn’t already been said on both this site & others? Overall they’ve been playing good hockey, though the games they’ve played bad in were very noticeable on the ice. But after winning the Great Lakes Invitational, having captain Diego Cuglietta named MVP of the tournament, having three (!) players named to Player of the Week in the WCHA last week, they’ve got to be flying high, albeit not nearly as high following news of the death of Max Humitz’ father on January 1st. Anchorage is hard place to play as they have an Olympic ice sheet, and of course the long flight. But they’ll be playing for more than themselves this weekend. Catch the action on 99.5 YESFm, or on TuneIn, where it will likely feature the Alaska feed. You can watch the game using FloHockey. WOOOOOOOOHOOOOOO! THE LAKERS WON THE GLI. Sorry, I had to get that out of my system. I’ve been flying high (mostly) since Monday evening, and needed to take some time before writing about my time in Detroit, and the GLI itself. WARNING: What follows attempts to be structured, but may look like word vomit. I am still excited, and just wanted to get my real feelings on this event out there. Ever since the news came out that the Lakers were going to be playing at the GLI, and the final dates were set, I’ve been moving full speed ahead towards going to the game. Making sure my colleague at work would cover my on call, seeing who was all going, figuring out where to stay & how the hell to move around the city. But was it worth it. First, let me say that I was really impressed with Detroit. The city was lovely as were the people. The food was good. The only bad thing I will say was the traffic a few of the nights, but I guess that can’t be helped. As for the tournament: Having only been in 1 NHL stadium before (the Wells Fargo Center in Philadelphia), I was pretty impressed by Little Ceasers Arena. Mostly. From the road, it would be easy to miss that you have a stadium where it’s at, since the facade is made to look like a set of restaurants or bars from the street. Now, I understand that it’s not for everyone, but I thought it was a clever use of the space. An aside: Despite the history of both the Red Wings and the Pistons, there was a distinct lack of memorabilia. Under some of the escalators featured some pieces, the store had a few, and they had the player statues from the Joe. But with the amount of dead space on the walls around the stadium, they could certainly add more, in much the same way as the Flyer had done. We made it to the stadium about halfway through the second period of the Michigan Tech-Michigan game, and it was very entertaining. It’s always fun to see former CCHA rivals in person, though we did see them earlier in the year. But despite it being a good game, lets face it, I wasn’t there for Tech or Michigan…I was there for our boys in blue. Despite Michigan State being a much worse team (on paper at least), they certainly kept up with the Lakers, forcing overtime to make it that much more interesting. And until that overtime goal, I had been trying my best to not imagine the Lakers being in the final. My heart wouldn’t have been able to handle that kind of heartbreak. But woo boy. Onto the all U.P Final. Lake Superior State University at Michigan Tech! The Lakers certainly looked good out of the gate, but allowed the Huskies to come back and tie it up, both at 2-2. The Lakers would go on to get two more, going up 4-2 before the Huskies got to 4-3. Then the first open-net. Then the second empty net with less than a minute. My eyes started to well up. They did it. The boys did it. It was all I could do to keep from openly crying as that clock was counting down, and the final horn rang out. The guys jumping over the board, surrounding Kossoff, celebrating. Seeing the MTU officials come onto the ice with the trophy and banner, handing both to the captains. Seeing them lift the trophy as if it was Lord Stanley’s cup itself. Knowing that the name of our school will be hanging in the rafters for the next year warms my heart, and makes me tear up just a little bit. You may be asking yourself why. Why get so emotional? But for anyone who has followed the Lakers for any time can attest: While some good players and teams have come and gone since the championship years of the early-mid 90’s, there really hasn’t been a whole lot to cheer for. Mediocre records, no real deep playoff runs, haven’t won a conference since 95 or 96, which was the last tournament appearance. But the GLI is one of the most well known tournaments in college hockey. Especially here in the great state of Michigan. It’s something to be proud of, to be able to hold high and to not only win it, but to really dominate their in-conference opponent makes it even sweeter. So I would like to thank the team for giving me a weekend I don’t think I’ll ever forget. And since I know this will get to him, and despite our differences, thank you too, Coach Whitten, for having this team come together to what many across college hockey thought was an impossible feat. And I hope that our athletic department does something special for this. Maybe blowing up the team photo, like the one seen above, and put it up somewhere in Abel Arena? I don’t know how the rest of the season is going to go, and even if I had a crystal ball, I’m not sure I would want to know. But what I do know is that for the first time in a while, I am really excited for this team, and I think we have a real shot at doing something this season, at least within the WCHA. Maybe the NCAA tournament is a lofty goal, but it’s one I do hope to see. 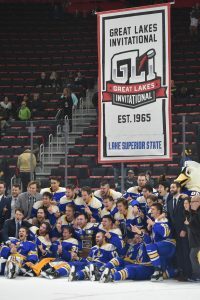 Shots from the Great Lakes Invitational final versus Michigan Tech and the subsequent celebration.